Alright. Before I tell you my opinion about this movie, first let me tell you that I really, really (from the deepest part of my heart) dislike Zac Efron. And his acting in this movie just added up my already-full list of the reasons why I hate him. Why couldn't he just act normally? I mean, like how boys are supposed to do? Well he's cute, we know that. And clearly he knows that, too. I think that's why he keeps doing those unnecessary gestures, like saying "Yo, girls! I know you're checking up on me." Yuck! This movie is about the adult Mike O'Donnell who turns into his 17-year-old self, getting a chance to repair his relationship with his two teenage kids and his (almost ex-)wife. The movie begins with a scene showing Mike when he was still in high school, getting ready for an important basketball game where he could get a college scholarship should he play good in it. Right before the game started, his girlfriend told him that she was pregnant. Mike left the game to chase her and asked her to marry him. The movie then skips into Mike in the present, 37 and in the process of getting a divorce. 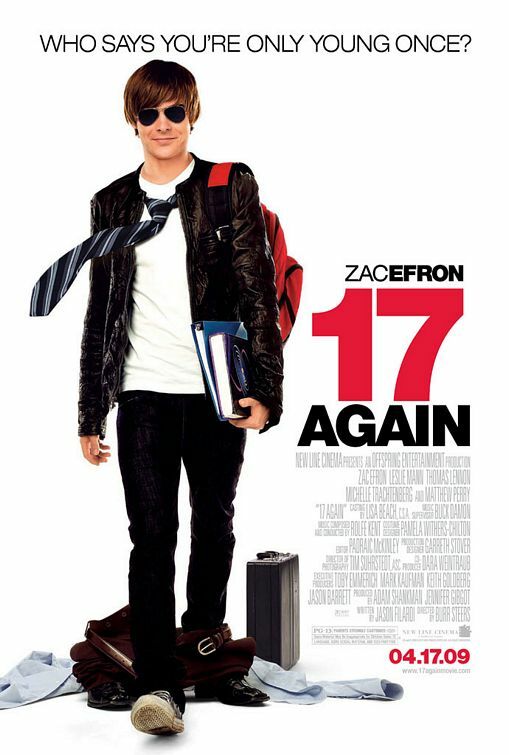 One night, he has an accident and he turns 17 again. Helped by his high school best friend, Ned, he enrolls in his old high school, where his two kids also go. He befriends them and so the drama goes on.